Should Messi be expected to carry Argentina? NIZHNY NOVGOROD, Russia (AP) — Lionel Messi, it seems, can do only so much. Ahead of Thursday’s critical World Cup match against Croatia on the banks of the Volga River, Argentina coach Jorge Sampaoli tried to temper the expectations weighing on his star player. “Leo shouldn’t shoulder all the responsibility,” Sampaoli said Wednesday. “He’s the best player in the world, but clearly it’s impossible that a single player completely changes the situation of a match. 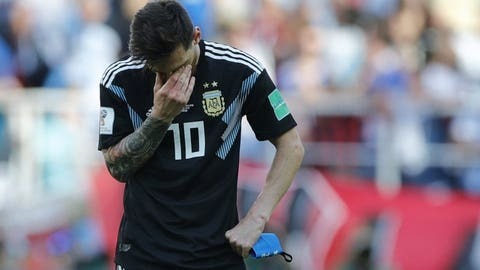 Messi missed a penalty in Argentina’s 1-1 draw against Iceland in the opening group match. That slip has piled the pressure on Argentina to win the second game against Croatia, which defeated Nigeria 2-0 in its opener. Messi turns 31 on Sunday, so this may be his last World Cup. Or at least the last in which he is widely viewed as the game’s top player. Ivan Rakitic, Messi’s teammate at Barcelona and part of Croatia’s powerful midfield with Luka Modric, has no illusions about the Argentine’s ability on the field. Sampaoli called the draw against Iceland “a blow” and said his players were frustrated but added that the team had recovered. Beyond Messi, this is yet another chance for Argentina to win a major trophy. The Argentines have won the World Cup twice, but not since 1986. In Brazil four years ago, Argentina lost to Germany in the final. The country’s last major title was the Copa America in 1993. More recently, the Argentines lost in the last two Copa America finals, in 2015 and 2016. Argentina will be a strong favorite against Nigeria in its final group match, but first comes Croatia. The top two teams in each group advance to the round of 16.